Stay, play and relax at a stunning waterfront lodge retreat. 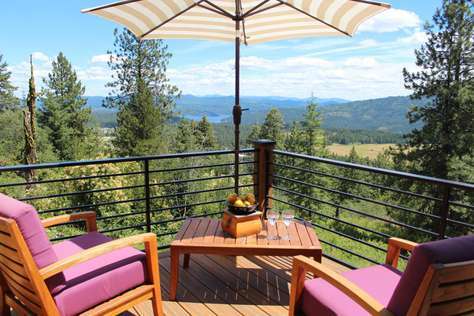 This luxury Coeur d’Alene vacation rental is ideal for family vacations, weddings, retreats, and group get-togethers. The waterfront lodge offers sunny south-facing location in the forest, sandy beach, beautiful lakeside lawn, boat dock, luxury features and amenities, guest cabin, privacy, and easy access to Coeur d’Alene and the Spokane International Airport, this is the premiere waterfront vacation home in Coeur d’Alene and North Idaho. 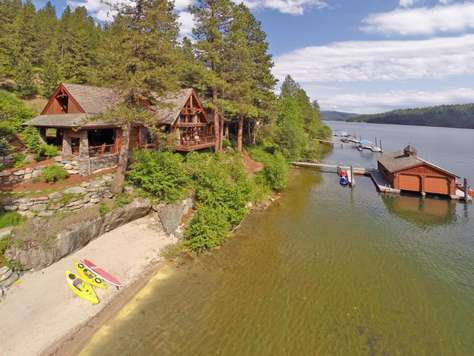 Located at 4622 W Mica Shore Road on 10 acres with 360 feet of private frontage on Mica Bay, Lake Coeur d’Alene, and flanked by majestic pine and fir trees, this gorgeous and inviting home has 5,500 square feet, five bedrooms with comfortable accommodations for 20 people (maximum guests 24), luxury master suite, a chef’s kitchen, indoor/outdoor entertaining space, a fully contained separate guest cabin with kitchenette, fireplaces, and a local resident moose that can sometimes be seen sleeping on the beach. Main house has three bedrooms (master suite with a king bed, bdrm#2 with a king and a full, and bdrm#3 with a queen, a full, and two twin size bunk beds), each with a private full bathroom. The guest house has two bedrooms (one with a queen bed and one with two queen beds), each with a private full bathroom. Moose Lodge Estate amenities are provided for all ages, including deluxe satellite TV and high-speed WiFi, ultra comfortable bedding, a home theater room, soaking tub, outdoor barbecue, kayaks, fishing gear, beach toys, bicycles, and firewood for fires on the beachfront. The guest cabin and beach are wheelchair accessible by request. What to do once you’ve reached this waterfront paradise? The sky is the limit! Moose Lodge Estate offers all your favorite water activities, including swimming, fishing, paddling, sunbathing and lounging on the beach. Boating, tubing, wakeboarding and wakesurfing are available by arrangement. The town of Coeur d’Alene, just 15 minutes away by car and 10 minutes by boat, has a thriving downtown scene with The Coeur d’Alene Golf and Spa Resort, boating services, coffee shops, wine bars, art galleries, upscale shopping, and an excellent dining scene. There are several world-class golf courses nearby, along with hiking and biking trails, Mayo Clinic-affiliated medical care and Silverwood Theme Park. 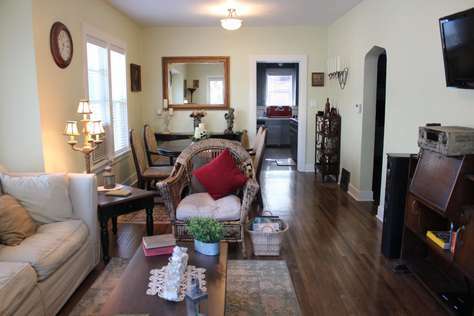 The home is dog-friendly, albeit on a case-by-case basis and with a non-refundable $150 pet fee. Please inquire before reserving online. Come for a week or stay a lot longer! Moose Lodge Estate is an unforgettable place where the good life just gets better. Please send an inquiry for additional information. We are always happy to help! 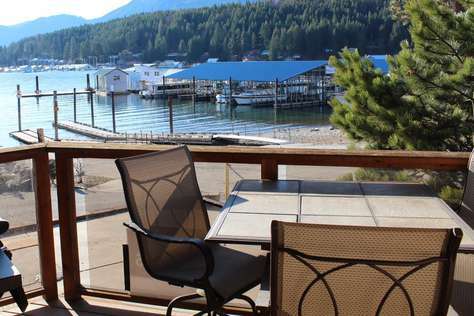 Located on Molstead Lane in Coeur d'Alene, this home offers amazing views of the lake and surrounding mountains. It is peacefully hidden away from all the action, yet is only about 10 minutes from downtown Coeur d'Alene. And, only about a 5 minutes drive to the Centennial Trail...best bike riding around. Just up the road is a 1-mile easy trail leading to Higgins Point where you'll find hideway beaches, picnic areas, and biking trail. This home has 3 bedrooms. Located on the main floor of this three level home, is a bedroom with two twin beds. Full bathroom with tub/shower combo on this level as well. On the top floor is the master suite with a king-size bed, breathtaking views of the lake, large walk-in closet, a private en suite bathroom boasting double sinks, a tiled walk-in shower, and a large soaking tub. Also, on the top level is an office area with a twin-size day bed and computer for guest use. Downstairs is a spacious 3rd bedroom with a queen-size bed and TV. Another full bathroom with a tub/shower combo is also on this floor. The home sleeps 7 comfortably. Located on the main level is a stunning gourmet, full-service kitchen with a large island and sitting bar. It opens into the large comfortable living room and dining area, with large exposed beams where the reflection of the lake dances along the walls. 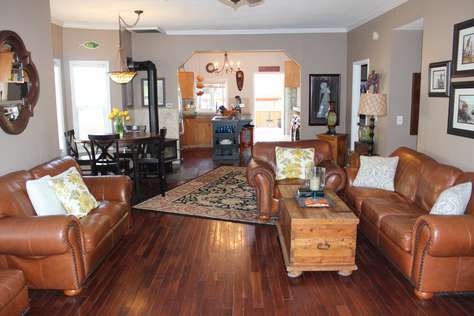 Leather furniture and rustic decor make this a wonderful place to relax and put your feet up. 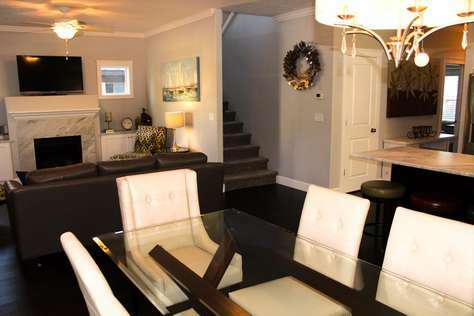 Downstairs is a second living area with a comfortable wrap-around couch, fireplace, and new shuffleboard table. Outside are two spacious decks with outstanding views of the lake. One with a table for six and chairs for lounging. The upper deck has a retractable awning for those scorching summer days. The decks face east, so plenty of warm sunshine in the morning and early afternoon followed by a lovely cooling shade in the hot late afternoon. Outdoor living at its finest! Sturdy steps cascade down the hillside to the water, private beach and dock below. On the dock, you will find a shaded shelter for one boat and extra cleats for a second boat. Handsome hardwoods, custom tiles, and top grade carpeting cover the floors throughout the home. This home has Internet and cable TV for your entertainment. This home has A/C on the top floor only. The main and lower floors DO NOT have A/C. Propane BBQ included. Laundry room is on the main level. The driveway has room for 2-3 cars and a boat trailer. RV's are not permitted. Pet are NOT permitted at this home. This is a family-friendly, quiet and peaceful area. Please send an inquiry for additional information. We are always happy to help! This home will book quickly! This home is truly a slice of heaven! 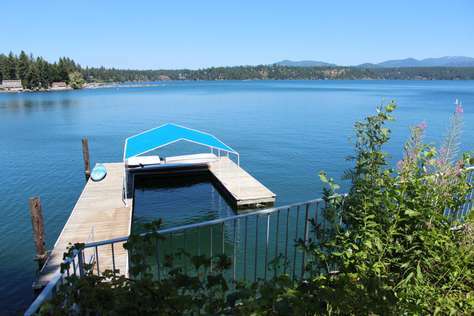 Located at 975 E. Crocus Court, on Powderhorn Bay just north of Harrison, this home offers some of the most beautiful views on Lake Coeur d'Alene. It is peacefully hidden away from all the action, yet only a few miles from the historic town of Harrison where you will find several restaurants and cafes, a local market, and one of the most delicious creameries in the area! Also, the infamous biking trail, Trail of the Coeur d'Alenes, runs right through Harrison. This home has 4-bedrooms. Located on the second floor of this two level home, a spacious master bedroom has a king size bed and breathtaking views of the lake. Also on the second level is a second bedroom with a queen size bed and a full bathroom with a jetted tub and a separate shower. On the main level is a third bedroom with a queen sized bed and a second full bathroom with a shower/tub combo. Down one level and separate from the main living areas, is a fourth bedroom with a twin bed. Also, a brand new full pull-out couch. This home has a beautiful wrap around kitchen with more breathtaking views of the lake and evergreen trees. The kitchen is stocked with all basic cookware and utensils. Outside on the multiple level deck is a table for six and a couple of lounge chairs for those lazy days. The deck leads down the sturdy steps to a private dock and boat slip. New swim ladder off the dock. A fire pit surrounded with Adirondack chairs is just the icing on the cake. Outdoor living at its best! This home has A/C, stackable washer and dryer, brickette BBQ, sound system, and a flat screen TV and Blu-Ray DVD player with a small selection of movies. Also includes iPod docking station. There is no internet or cable TV at this time. The water in this bay is clear and without weeds. Powderhorn Bay has long been known as prime territory for water skiing & wakeboarding due to its' protected waters and also known for its good fishing for kokanee, small-mouth bass, pike, and Chinook salmon. Dogs are allowed, albeit on a case by case basis and with a $150 pet deposit. Please inquire before booking online. This home books quickly! Please send an inquiry for additional information. We are always happy to help! 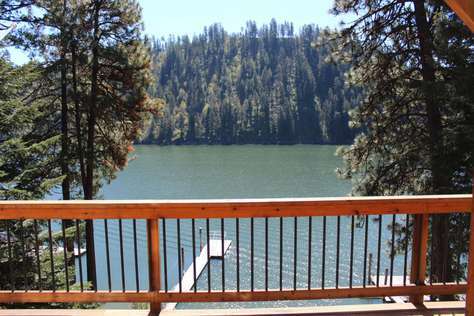 Located at 32185 E. Hayden Lake Road, this home offers some of the most beautiful views Hayden Lake has to offer. It is peacefully hidden away from all the action, yet is only about 25 minutes from town, and 40 minutes from Silverwood Theme Park. This home has 4-5 bedrooms. Located on the main floor of this three level home, is a spacious master suite that has a queen-size bed with a private en suite bathroom boasting double sinks and a tiled walk-in shower. Upstairs is a spacious second bedroom with a queen-size bed and a second full bathroom with a tub/shower. Also, on the second floor is a sitting area with a full-size futon that sleeps two. On the ground level, you will find two more bedrooms, one with a gorgeous view of the lake below. A third full bathroom with a shower/tub is in the hallway connecting the two bedrooms. A full wrap around couch is on this level, which can sleep one adult or two little ones. Surrounded by summer screens and hanging over the blue water below is a 5th bedroom/summer porch; it's on the main level with a full-size bed and private door to the sun deck. Plenty of floor space throughout this home for blow-up mattresses or roll-away beds. One roll-away bed is provided. It has a stunning gourmet, full-service kitchen, including a wine cooler in the wrap-around island/bar. It opens into the large formal living room and dining area, where a friendly buffalo watches from over the fireplace. Leather furniture and rustic decor make this a wonderful place to relax and put your feet up. Downstairs is a second living area with a gas fireplace, flat-screen TV, bar area, telescope, and foosball table. 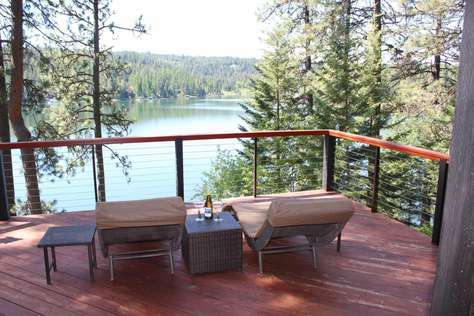 Outside are two spacious decks with outstanding views of the lake. One with a table for six and a built-in propane BBQ, granite counter space, and small refrigerator. This deck has a retractable awning for those scorching summer days. The second has loungers and space to relax and get-away from it all! On a grassy area on the side of the house is a fire pit surrounding by Adirondack wooden chairs. Outdoor living at its best! Sturdy steps cascade down the hillside to the water and dock below. On the dock, you will find a covered boat slip, a swim ladder, a paddle boat, and extra cleats for a second boat. Handsome hardwoods, custom tiles, and top grade carpeting cover the floors throughout the home. This home does not have Internet, and the cell service is poor for some carriers; however, there is a landline connected for your convenience and Direct TV for your entertainment. This home has A/C. Laundry room is on the ground level. The driveway has room for 4-5 cars easily...possibly 6 with some creativity. RV's are not permitted. Inquire about last-minute special rates! Dogs are allowed, but ONLY on a case by case basis and with a $150 non-refundable pet fee. Please inquire to discuss pet options/reservations. This home is truly a slice of heaven! Please send an inquiry for additional information. We are always happy to help! 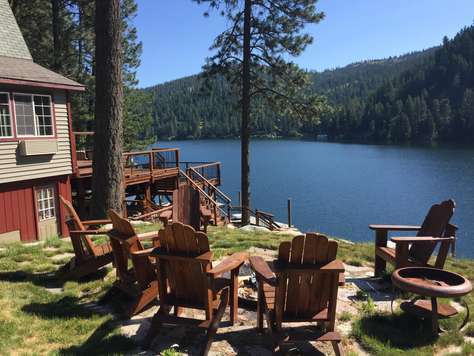 Located on E. Hayden Lake Road, this home is approximately 15 minutes from downtown Coeur d'Alene. It has 3 bedrooms. Two cozy bedrooms, one with a queen bed and one with a full bed, are on the main level of this two level home. Located on the lower level, a spacious master bedroom has a king-size bed with a large window showcasing the amazing view of Hayden Lake. Two full bathrooms with shower/bathtub combo are on each level. As you enter on the main level, you will find a spacious kitchen with island/bar area, large formal living room with a baby grand piano, and a lovely dining area...all looking out over Hayden Lake through the large picture windows. Absolutely gorgeous view! Just a few more steps lead you out onto the deck area with table, chairs, and lounge chairs. On the bottom floor, you will find a second living room with two reclining chairs and a pull-out couch sleeping two additional guests...also with a wonderful view of the lake. And, you will also find an antique organ for all of the musicians in the family. Outside is a spacious deck on the main level and covered patio below on the lower level....both with outstanding views of the lake. With a vivaciously green lawn, there is plenty of room for all the classic summertime activities! 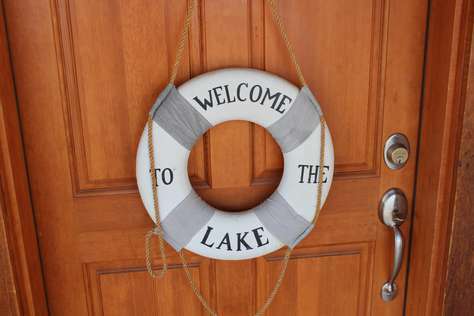 Several sturdy stone steps lead down to the private dock, where you will find a covered boat slip and a swim ladder to accommodate all the swimmers. This home has A/C. Briquette BBQ. Laundry is located on the bottom level. The driveway has room for 4 cars. RV's are not permitted. This charming home is truly a slice of heaven! Please send an inquiry for additional information. We are always happy to help! Located at 12547 N. Rosco Rd, Hayden Lake, ID 83835. Intimate enough for just two, or room enough for friends or family, this cottage has its own community shared-private south-facing beach set amid towering pine trees. Two bedrooms, each with queen-size beds, and one full bathroom with a shower/tub. Full kitchen with everything you should need to prepare everything from beach sandwiches to BBQ feasts. Sunrises and sunsets are beautiful from here. Join us for life on the lake! One boat slip provided with rental. Please no RVs, trailers, campers or tents. DOGS only are welcome, albeit on a case-by-case basis, and with a non-refundable pet fee of $150. Please inquire to discuss pet options. Located at 418 S. 13th Street downtown Coeur d'Alene, this home includes everything one would need for a comfortable getaway. Maple-lined streets wind past beautifully unique vintage homes. From the moment you walk through the front door, you will be swept away with the classy, contemporary decor throughout this beautiful home. Absolutely stunning! This home is a few blocks north of Sander's Public Beach and Tubbs Hill with all of its lovely trails and private beaches. It's a block away from the Centennial Trail and just minutes from Coeur d'Alene's main street, where you will find many fine eateries, cozy coffee shops, sophisticated wine bars and breweries, original boutiques, and adventurous antique shops. The city beach, Coeur d'Alene Resort, public library, and McEuen Park with tennis courts, basketball courts, water park, playground, and dog park are all just moments from your doorstep. Just a few blocks up the street is a local favorite, Moontime Pub and Grill, and just around the corner is the infamous floating green at The Coeur d'Alene Resort Golf Course. A pretty perfect location! SEASONS can even set up a bike rental and deliver to your doorstep before your arrival. This home has four spacious and comfortable bedrooms with plenty of natural light. The master suite, on the main level, has a king-size bed with an en suite bathroom with a beautifully crafted walk -in shower and a double sink/vanity. Located on the second floor, bedroom 2 has a king bed, bedroom 3 has a queen bed, and bedroom 4 has a full bed and a twin pull-out trundle. All bedrooms have brand new, plush mattresses. Also upstairs are two full bathrooms, each with a shower/bath combination, and one is a private en suite to the 4th bedroom. The gourmet kitchen, spacious and elegant, has every amenity imaginable from top of the line appliances and Carrara marble countertops to solid cookware and dishes needed to whip up a special meal to share with your guests. Included is a gas-range cooking top, microwave, dishwasher, large and deep sink, Kureg coffee maker and toaster. A chef's dream! An elegant dining table for six designed to be flickering with candlelight. The living room has a comfortable couch and a couple of lounge chairs that look onto a gas burning fireplace...perfect for those crisp, chilly evenings! Also, a flat-screen TV hangs just over the fireplace. On the second level is a large entertainment room with comfy leather reclining chairs, a 70-inch flat screen TV, a great game table, and plenty of space to relax or play. And for those warm evenings, a lovely stone patio with charming Adirondack chairs and a BBQ/smoker, is nestled between the home and the separate garage. The private backyard is fenced in completely. The landscaping and lawn are well kept and maintained. Large washer and dryer in a separate laundry room for extended stays or dirty expeditions . And, secure parking in a two-car detached garage. This home has cable TV, a DVD player, wireless internet, and A/C. What's more....the owners were thoughtful enough to include 3 bicycles for guest use...2 adult size and 1 children. DOGS are welcome, albeit on a case-by-case basis, and with a refundable pet deposit of $500. Dogs are not allowed on any carpeted areas in this home. Please inquire to discuss pet options. Located on Mountain Avenue in downtown Coeur d'Alene, this darling home includes everything one would need for a comfy and relaxing getaway. You can feel the loving details its owners put into restoring and furnishing this darling home. You couldn’t ask for a more perfect location! This home is two blocks north of Sander's Public Beach and only steps from Tubbs Hill with all of its lovely trails and private beaches. It's two blocks away from the Centennial Bike Trail and just minutes from Coeur d'Alene's main street, where you will find many fine eateries, cozy coffee shops, sophisticated wine bars and breweries, original boutiques, and adventurous antique shops. The city beach, Coeur d'Alene Resort, public library, and McEuen Park with tennis courts, basketball courts, water park, playground, and dog park are all just moments from your doorstep. Just a few blocks up the street is a local favorite, Moontime Pub and Grill, and just down the street is the infamous floating green at The Coeur d'Alene Resort Golf Course. As mentioned previously, a pretty perfect location! SEASONS can even set up bike rentals and deliver to your doorstep before your arrival. This home has two bedrooms, each with a queen-sized bed. One of the bedrooms has a flat-screen TV. The couch in the living area pulls out to sleep two more people. A full and bright bathroom is nestled between the bedrooms with a tub/shower combination. The cute kitchen is supplied nicely with plenty of cookware and dishes to whip up those special meals shared with your family. Included is a gas-range cooking top, traditional coffee maker, and toaster. A comfortable dining area with a crafted wooden table, seats 6 people comfortably. This home has wireless Internet and the TV is Netflix ready. A/C is available for the hot summer temperatures, and there are chairs around a firepit for those enchanting evenings. Washer and dryer are included for those extended stays. Home is on a corner lot, so plenty of on-street parking available for trailers. DOGS only are welcome, albeit on a case by case basis, and with a non-refundable pet fee of $150. Please inquire to discuss and receive approval for your dog. From the moment you walk through the creeking wooden screen door, you are swept back to a time when life was simpler...slower! Originally built in 1910 and located on 3rd Street downtown Coeur d'Alene, this newly restored vacation home includes everything one would need for comfortable getaway and relaxing in style. You can feel the loving details its owners put into restoring and furnishing this beautiful home. It is just blocks north of Sherman Avenue, Coeur d'Alene's main street, where you will find many fine eateries, cozy coffee shops, sophisticated wine bars and breweries, original boutiques, and adventurous antique shops....all within easy walking or biking distance. This home is only 1 block from Midtown Coeur d'Alene where you will find more local favorites...Pilgrims Natural Market, Capones Bar and Grill, Blue Bird Cafe, Syringa Japanese Cafe and Sushi Bar, and The Garnet Cafe (best breakfast in town). Also, several treasure-filled antique shops to stroll through after a yummy lunch. The city beach, Coeur d'Alene Resort, public library, and McEuen Park with tennis courts, basketball courts, water park, playground, dog park, and Tubbs Hill's trails are all only minutes away. We can set up a bike rental for you and deliver to the home before your arrival. This home has two bedrooms, each with a queen-sized bed and super plush, brand new 13 inch mattress. One of the bedrooms has a flat-screen TV. A full bathroom is nestled between the bedrooms with a tub/shower combination. The spacious kitchen with the original farm sink is supplied nicely with brand new cookware and dishes to whip up those special meals shared with your guests. Purified water system on sink, so no need to stock up on bottled water. Included is a gas-range cooking top, microwave, traditional coffee maker, and toaster. A formal dining area with a crafted wooden table, flickering with candlelight, seats 4 people comfortably. The cozy living room has a comfortable couch and two elegant chairs looking upon a large flat-screen TV mounted to the wall. Entertainment abounding! This home has Roku TV, wireless Internet, and sound system. Custom tile and original hardwoods throughout this home. Many of the light fixtures were saved from when the home was originally built. A/C is available for the hot summer temperatures, and there is a beautiful patio within the fenced back yard for those soft breezy mornings and enchanting evenings. On the private patio, there are table and chairs, comfortable lounging chairs, a hot-tub, and a propane BBQ. The landscaping and lawn are absolutely lovely and well kept. Washer and dryer are included for those extended stays. There is a long paved driveway beside the house, perfect for safe parking and boat trailer storage. The charming waterfront condo is located at 34152 N. Lakeside Ave #5, Bayview has two bedrooms, each with a queen-size bed. The living room features a pull-out couch to sleep two more people. There is a full bathroom with walk-in tiled shower. Washer and dryer are included inside the condo. You and your guests will appreciate the full-service kitchen and dining area. Hardwood floors. Two flat screen TVs with DVD players, one in living room and one in master bedroom. Bose sound system. Wireless Internet. Electric fireplace. Sunrises and sunsets can be particularly beautiful from the deck. Two kayaks are included with this rental! 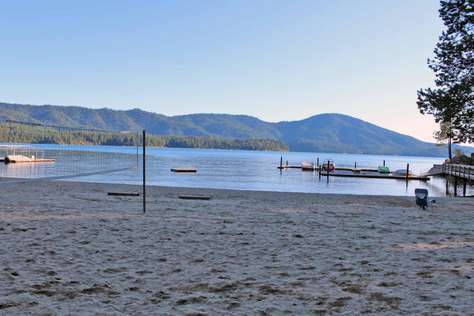 Shores of the beautiful and wild Lake Pend O'reille is just steps from your front door. Wild goose watching is an everyday entertainment. Coeur d'Alene is an easy 30-minute drive away. 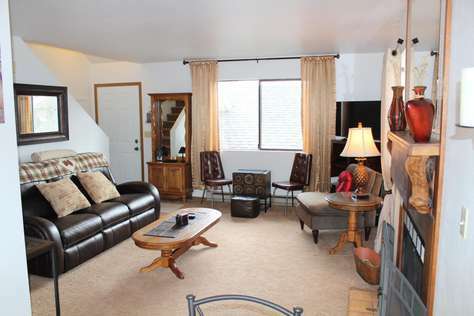 Bayview Condo #14 is located at 34152 N. Lakeside Ave, Bayview, ID 83803. It has two bedrooms, each with a queen-size bed. There is also a pull-out sofa that will sleep two more children or small adults; the mattress is quite thin and not the most comfortable for those needing more support. You'll appreciate having two full bathrooms, a scenic outside deck with table for four, and a convenient washer and dryer inside the condo. Amenities include a full-service kitchen, hardwood floors and flat screen TV with DVD player. The music system will accommodate your iPod, iPhone or favorite CDs. Restaurants/store/coffee shops are all within walking distance, in the charming community of Bayview. Dogs ONLY are allowed with a non-refundable pet fee of $150.00. Contact SEASONS at lisa@seasonsfpm.com to set up a pet reservation before booking online. This home, located at 214 Garden Ave, Coeur d'Alene, is one of the best downtown locations you can find. It is just four blocks from the Coeur d'Alene Resort. It has 3 bedrooms, two with queen beds and one with twin bunk beds, so it sleeps 6 comfortably. There are two full bathrooms...one with a walk-in shower and one with a jetted tub/shower. It has wireless internet, flat screen TV, Blue ray DVD player, and a library filled with books to borrow. Back deck has BBQ, firewood for wood burning stove, table for six, lounge chairs, and a large comfy hammock. Dogs are welcome with a credit card on file. Home rents for $2000 per month including all utilites, Internet, and basic cable TV, October through May only! Life is good here. Check out the photos and contact SEASONS Fine Property Management today. NEW PHOTOS AVAILABLE SOON! HOME HAS BEEN REMODELED/REDECORATED RECENTLY! Quite literally on the water’s edge, this charming floating home with covered boathouse located in Bayview, Idaho has two bedrooms, each with a full-size bed. The living room features a pull-out futon sleeping two more people. There is a full bathroom with shower/tub combo. Washer and dryer are included inside the covered boathouse area, which is connected to the home. You and your guests will appreciate the kitchen and spacious living area overlooking the gorgeous Scenic Bay of Lake Pend O’reille. The kitchen has an electric oven/stove, vintage sink, full refrigerator, coffee maker, and microwave for those quick treats. The living area includes a futon, two comfortable leather reclining chairs, a flat-screen TV with DVD and Dish TV included. Both bedrooms are a few steep steps up into cozy yacht-style nooks, each with a full-size bed fit with ThermaRest mattress, a flat screen TV, and small fan. Hardwood floors throughout. Wireless Internet is available at this location, and Ralph’s Coffee House, a short-walk up the street, provides free Internet service as well. Out on the front dock, you will find comfortable lounge chairs, a table for four, a BBQ, and a swim ladder. The views are incomparable and breathtaking! Sunrises and sunsets can be particularly beautiful here. This cabin does not include A/C, but portable A/C units are available for rent ($75 per unit including delivery, set up, and pick-up). Ask for more details or to make a reservation. The covered boat garage fits up to a 26-foot boat. Two fishing kayaks are included with the rental. Also, two fishing poles and tackle are included and available for guest use. A small/medium size dog is allowed, but ONLY on a case-by-case basis and with a $150 non-refundable pet fee. Please inquire to discuss pet options before making a reservation. This home is truly a small slice of heaven! Please send an inquiry for additional information. We are always happy to help! The perfect place to immerse yourself into the special culture of Coeur d'Alene/Hayden. Enjoy hiking, biking, swimming, boating, shopping, dining out or just relaxing and breathing it all in. Located at 8206 Ridgewood Drive, Unit #3, just north of Prairie Avenue, this home is nestled in a very central location. Lake Coeur d'Alene and its downtown are just a short 10-15 minute drive away. It is peacefully hidden away from all the action, yet is only minutes away from shopping, local markets including the seasonal Farmer's market, delicious dining, movie theater, library, gym with indoor tennis courts, Avondale golf course and clubhouse dining, and across the street from a lovely local park and playground. Just down the street is Hayden Lake's Honeysuckle Beach & boat launch with docks perfect for swimming and fishing. A five-minute drive along Hayden Lake takes you to Tobler's Marina and its waterfront Boathouse Restaurant infamous for their fish and chips. As part of the condo's association, you will have access to two private community, seasonal pools and well-maintained tennis courts on the edge of the evergreen forest, which leads to beautiful and a well-maintained hiking trail...all of which are walking distance from your front door. This condo, an end-unit with plenty of natural light, is furnished beautifully and thoughtfully by its owners. It has two bedrooms and one full bathroom. Both bedrooms are on the second floor with the full bathroom located between them. The master bedroom, a spacious room boasting a comfortable king size bed, and the second bedroom has a cozy full size bed. The bathroom has a bathtub/shower and a lovely sink/vanity with plenty of storage. On the main level, this home has a wrap-around full kitchen stocked with everything one would need to create everything from jam on toast to fillet mignon. There is a dishwasher, microwave, coffeemaker and fresh coffee grinder, Crockpot, and toaster, as well as many pots, pans, and dishware. A welcoming and sunlit dining area looks out to the open air patio, where in the warm season, you will find charming patio furniture and a George Foreman electric grill. A spacious living room, which opens out into the dining area and kitchen, has everything needed to cozy in for the evening. A comfortable leather couch and chairs, a classy natural fireplace (Duraflame logs only), a sleek 32-inch flat screen TV with Blue Ray and a DVD player, and a game table that includes many enjoyable classic board games, and several soft blankets for snuggling. Connections are set up for cable or internet hook-ups, but this service is not provided by the owner for monthly rentals. There is no A/C, but ceiling fans in dining room and both bedrooms provide a wonderful breeze. Portable A/C units available for rent; ask us for more details. A one-car carport sits at the front of the property; an additional uncovered parking spot is included as well. Also included is a secure storage closet under the carport with plenty of room for bikes, skis, boxes, etc. Monthly Rentals - This home rents for $1200 per month (NOT including heat/electric) September through May. Summer rental rates for June, July, and August are $1650 per month (includes all utilities). This condo is a must see and will be booking up quickly! Contact us to book today.